Most, Least Honest Cities: Where Are People Most Likely to Return a Lost Wallet? Helsinki is the most honest city in the world, Lisbon is the least. 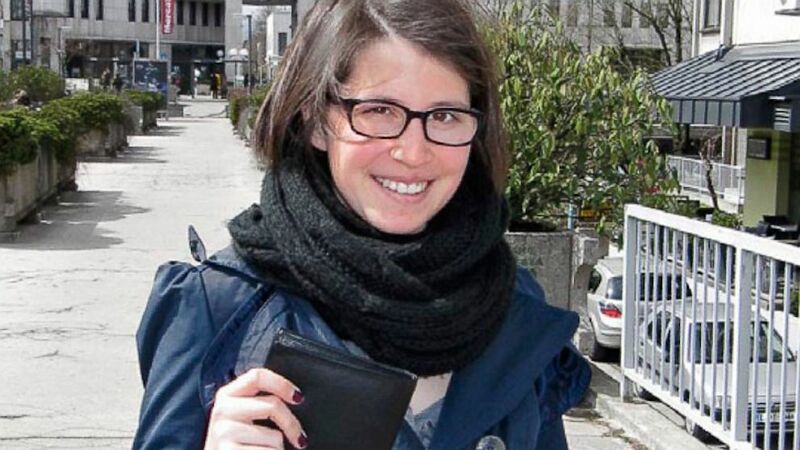 camera (Miha Bogovcic) Manca Smolej, 21, a student in Ljubljana, Slovenia, said she did not even consider taking the money from a "dropped" wallet planted by Reader's Digest. Don't drop your wallet in Lisbon: That's one finding from an experiment designed by Reader's Digest to test the honesty of people in 16 major cities worldwide. Of a dozen wallets dropped in Lisbon, only one was returned. Go ahead, though, and lose your wallet in Helsinki: There 11 of out 12 lost wallets were returned. In the experiment, Digest reporters deliberately dropped a total of 192 wallets in 16 cities in Europe, Asia and North and South America. Each one contained a cell phone number, a family photo, business cards and $50 U.S. (or the local equivalent). In "How Honest Are We?" a story in its October issue, the Digest reports that a total of 90 wallets (47 percent) were returned. Raimo Moysa, editor in chief of Reader's Digest International Magazines, planned and oversaw the test. "We had fun," he tells ABC News. The test was not the Digest's first. "We did a test like this back in 1996," says Moysa, "but it was limited to Europe. Then we did one in the U.S. in 1995, and in Asia in 1997." What were the surprises this time around? Lisbon's honesty, he says, has gone way down. "In 1996, they returned half the wallets we dropped there. This time, only one was returned—and that one by a Dutch tourist." Not a single wallet was returned by a Lisbon local. By contrast, Mumbai's honesty has increased: In 1997, half the wallets dropped there were returned. This time: two-thirds. The Digest's story quotes one honest Mumbai local, Rahul Rai, a 27-year-old video editor, as saying: "My conscience wouldn't let me do anything wrong. A wallet is a big thing, with many important documents in it." Mumbai placed second most-honest, after Helsinki, Finland. Helsinki's locals returned 11 out of 12 wallets. Business school student Lasse Luomakoski, 27, who was responsible for one of those returns, told the Digest: "Finns are naturally honest. We're a small, quiet, close-knit community. We have little corruption, and we don't even run red lights." New York City fared surprisingly well, coming in tied for third with Budapest, Hungary. In each, eight wallets were returned, one with the aid of New York teacher Michael Lupanucci, 46. "It's so easy to be cynical," the Digest quotes him as saying. "But especially after 9/11, that instilled companionship in everyone." Around the world, the reasons people gave for returning wallets varied. Some said they had acted automatically, without thinking, driven by their upbringing or by personal morality. "I am an officer, and I am bound by an officer's code," said a security guard in Moscow who returned a wallet. Others said they acted out of sympathy for the presumed owner. An honest soul in Berlin said he was motivated by the photo in the wallet that he found: "I saw the photo of the mother with her child. Whatever else is important, a photo like that means something to the owner." Wealthy cities were not necessarily more virtuous than poor. Zurich, Switzerland, placed 13th--far behind slum-choked Mumbai (and immediately behind Rio). In Zurich only four wallets were returned. "In one of the wealthiest cities in Europe," writes the Digest of Zurich, "a tram driver…found our wallet. After taking a good look at the contents, he pocketed the wallet, money and all…despite the fact that the [transit authority] is in charge of the city's lost and found office." Fiery Cushman, an assistant professor of cognitive, linguistic and psychological science at Brown University's Moral Psychology Research Laboratory, calls the Digest's experiment "a fun idea." Psychology, he tells ABC News, "should not have a monopoly on experiments." But, he adds, it would be a mistake to draw conclusions from dropping 12 wallets in a city the size of London, Mumbai or New York: The number of returns (or thefts) is too small to be statistically significant. Moysa tells ABC he probably will repeat the Digest's test in a few years, although with changes. Up to now, he says, no effort has been made to contact or interview the thieves. It might be interesting, he thinks, to hear their reasons why they stole—just as it's been interesting, he thinks, to hear the good Samaritans' reasons for why they returned their found wallets. "Maybe we can figure out a way to do that," he says.